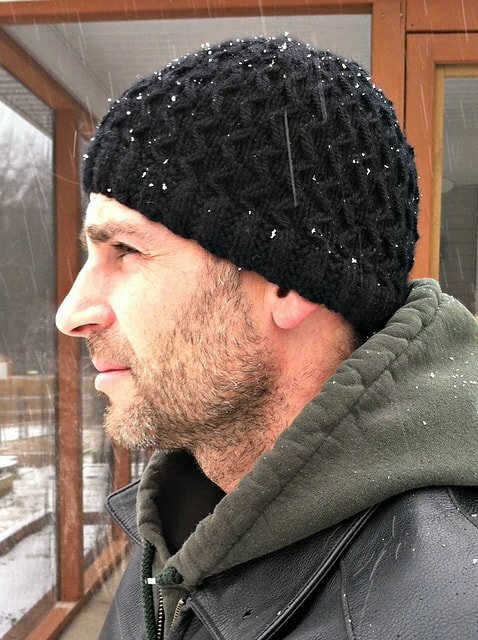 Free Knitting Pattern - Slip Stitch Hat - love. life. yarn. So, I finally did it. I actually made something for my husband! He is really not into knits and I have never been able to make something for him that he would actually wear so after one scarf attempt back when I first started knitting (and didn’t know how to make anything else!) I never made anything for him again. It’s been nine years and three kids!! I figured it was about time I made him something. I remembered that he had accidentally washed his favorite hat he got way back when he was in the Army and ruined it. Since he wears mostly black I figured it was worth a try to create a black hat for him. I am working on expanding my knitting skills and have been enjoying slip stitch techniques, so I put the two together and came up with this project. If you are new to slip stitches, don’t be afraid to tackle them! Plenty of times when it said to let them hang off the needle I was terrified I would lose stitches, but I didn’t. I haven’t had a lot of practice correcting my errors, although I am getting better at it if I lose a stitch and it unravels a few rows. I used to just give up and scrap the whole project, but not anymore! I love expanding my knitting skills and will most definitely keep working on them. Buy a large print, ad-free pdf of this pattern for $1.99 in my Etsy Store. Slip all stitches purl wise. Using size 3 needles, cast on 120 sts evenly on four dpn’s; join, being careful not to twist. Repeat rounds 1 and 2 until piece measures 1″, ending with round 1. Repeat rounds 1-8 four more times (40 rows). Round 1: *Ssk, k2tog, k26; rep from * – 112 sts. Round 2: *K2, (sl 1, k3) six times, sl 1, k1, (sl 1, k3) seven times, rep from *. Round 3: *Ssk, k2tog, k2, (sl 1, k3) five times, sl 1, k1, Ssk, k2tog, (sl 1, k3) six times; rep – 104 sts. Round 4: K4, (Sl left) five times, k4, (Sl left) six times, k4, (Sl left) five times, k4, (Sl left) six times. Round 5: *Ssk, k2tog, k22; rep from * – 96 sts. Round 6: *K4, (sl 1, k3) five times, k2, (sl 1, k3) five times, k2; rep from *. Round 7: *ssk, k2tog, (sl 1, k3) five times, ssk, k2tog, k2, (sl 1, k3) four times, sl 1, k1; rep from * – 88 sts. Round 8: *(Sl right) five times, k4, (Sl right) four times, k4; rep from *. Round 9: *Ssk, k2tog, k18; rep from * – 80 sts. Round 11: *Ssk, k2tog, k2 (sl 1, k3) three times, k2, ssk, k2tog, (sl 1, k3) four times; rep from * – 72 sts. Round 12: *K4, (Sl left) three times, k4, (Sl left) four times; rep from *. Round 13: *Ssk, k2tog, k14; rep from * – 64 sts. Round 14: *K4, (sl 1, k3) three times, k2, (sl 1, k3) three times, k2; rep from *. Round 15: *Ssk, k2tog, (sl 1, k3) three times, ssk, k2tog, k2 (sl 1 k3) two times, k2; rep from * – 56 sts. Round 17: *Ssk, k2tog, k10; rep from * – 48 sts. Round 19: *Ssk, k2tog, k8; rep from * – 40 sts. Round 20: *Ssk, k2tog, k6; rep from * – 32 sts. Round 21: *Ssk, k2tog, k4; rep from * – 24 sts. Round 22: *Ssk, k2tog, k2; rep from * – 16 sts. Round 23: *Ssk, k2tog; rep from * – 8 sts. Cut yarn, leaving a long tail. Draw yarn through remaining sts and pull tight. Weave in ends. Question if I can reduce the number of stiches cast on and still have this work. I have some bulky yarn and #3 needles, but when cast on 120 stiches the hat is way too big. I might not be able to use this yarn but was hesitant to reduce the number of stiches given that it might mess up the decreases and the alignment of the pattern. I can’t see going much smaller than a #3 needle, or if that would even help much. Any thoughts? Can I even use this yarn? This pattern is a four stitch repeat so you could try to refigure the numbers taking one repeat away from each needle (so you would cast on 104). The decreases will be the tricky part, but they shouldn’t be too bad. I decreased where the needles meet so if you just take away one four-stitch repeat out of the middle of each needle, it should work. If that gets too complicated I would switch yarns. Let me know if you have any other questions! I love this pattern.my decreases are much simpler and will work with any multiple if 8 stitches. This takes off 8 sets every other row, while maintaining the pattern almost uninterrupted. 3 1/2 to 4 inches, stopping with 16 stitches. I use # 9 needles and 80 or 88 sets. Nancy, can you write out your pattern? “Big sister” auto corrected wrongly. Ask should be ask and 8 stitches are removed, not sets. Sorry I didn’t proofread ! It did it again ! Slip slip knit, not ” ask” . Hello, I’m knitting this hat and my yarn and gauge are different from the pattern. I’ve made the adjustments for the # of stitches to cast on, but I’m wondering if you can tell me in inches how long I should work the main pattern before starting the decreases. I know that you have the gauge as 32 rows = 4 in but I assumed that was in stockinette stitch, not the pattern stitch, which is a little condensed I think. Anyway, your help would be appreciated. Is round 2 of the ribbing really “knit”? 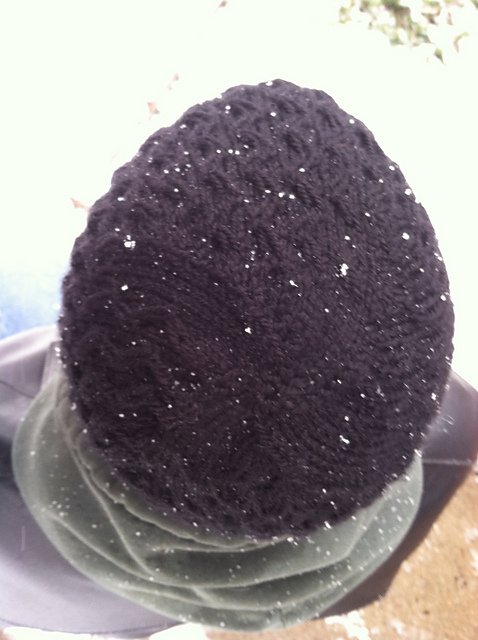 Not entirely sure as the hat in the picture is black but it looks like regular 2k 2p ribbing to me. Thanks Amanda! That’s very cool. I will follow the pattern exactly. I plan to start on this hat tonight and appreciate your clarification. You are so welcome! I’d love to see pictures when you are done! I could not figure out the zip zag pattern at all!! The slip stitches are very confusing and the pattern doesn’t differentiate between the types of slips during the pattern. For example; slip, slip 2; slip one; moves two stitches over slip stich and knit 3. 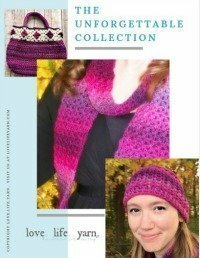 The pattern needs to tell you whether you slip “knit wise” or “purl wise”. I love the look of the pattern, but cannot figure it out. Help! Thank you so much for your reply. It makes perfect sense now, since you stated your slip stiches were “purl wise”. That would have been helpful to add to your pattern instructions, as slip stitches are normally knit wise unless stated otherwise. It will definitely try that again with another hat. Hi Karen! I got the gauge listed with the larger needle. The smaller one is for the ribbing. To get gauge sometimes you have to try several needle sizes so keep trying until you get one that works or is at least very close and use a smaller needle size for the rib. Thank you so much for the prompt response 😃 I just finished the hat and it’s gorgeous 😍 my husband loves it. Thanks a ton and keep rocking with your amazing designs. Yay!! I’m SO glad it worked out! I’m trying to find more things I can make that husbands won’t mind wearing 😉 Mine is so picky that is the only thing so far I have made him that he will wear. Hi! I was just wondering for when you are shaping the crown, if in round two you only repeat the part in the parentheses? Thanks! Okay thank you! Also, for shaping the crown on round 4, I’m not familiar with sl left and can’t find it on the web. Could you clarify for me? Thanks! I am loving this pattern now that I have figured it out! The part that I’m getting stuck on is the first part of shaping the crown. When I complete round 1 I have 116 stitches left instead if 112. If I keep working following the pattern it gets all wonky. Can you help me with this please? Sl Purl wise? Or knit wise?